Opinions! Everybody's got them. Some people offer it cheaply, while a few others wait until it is asked for. 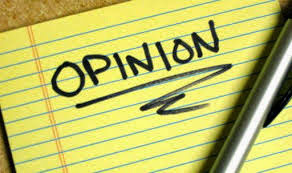 opinions can be the cheapest commodity, after all, every one is entitled to his own opinion. If you will set about any major feat it's good to get a handful of great opinions from people, however just like a student researching for a thesis, my University Dean once advised 'you need to know when to stop reading and start writing'. It's always wise to get a honest opinion from a few stakeholders and move on. If somebody will have to get everybody's opinion, he will end up doing nothing, because nobody gets nothing done by listening to everybody's opinion. I will illustrate this with another short story in my next post....after all, a man has got to do what he's got to do.